The protection of natural resources and biodiversity through protected areas is increasingly based on ecological principles. Simultaneously the concept of ecosystem-based management has become broadly accepted and implemented over the last two decades. However, this period has also seen unprecedented rapid global social and ecological change, which has weakened many protection efforts. These changes have created an awareness of opportunities for innovative approaches to managing protected areas and of the need to integrate social and economic concerns with ecological elements in protected areas and parks management. A rare collection of articles that fuses academic theory, critique of practice and practical knowledge, Transforming Parks and Protected Areas analyzes and critiques these theories, practices, and philosophies, looking in-detail at the emerging issues in the design and operation of parks and protected areas. 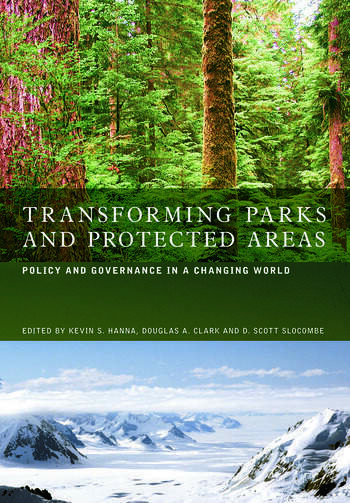 Addressing critical dynamics and current practices in parks and protected areas management, the excellent volume goes well beyond simple managerial solutions and descriptions of standard practice. With contributions from leading academics and practitioners, this book will be of value to all those working within ecology, natural resources, conservation and parks management as well as students and academics across the environmental sciences and land use management. Kevin Hanna teaches environment and resource policy, environmental assessment and land use planning at Wilfrid Laurier University. His research centres on integrated natural resource management, impact assessment, forestry communities, and regional planning approaches. Scott Slocombe has taught resource and environmental management at Wilfrid Laurier University since 1989. His research and consulting interests focus on protected areas, environmental planning, management, policy and education, and systems approaches. Doug Clark studies and teaches governance for social-ecological systems, focusing on the circumpolar north. Doug spent 11 years with Parks Canada in a variety of postings, including as the first Chief Warden of Canada’s Wapusk National Park established in 1997. He has twice received Parks Canada's Award of Excellence from the Agency's C.E.O. and in 2004 he became a Canon National Parks Science Scholar.